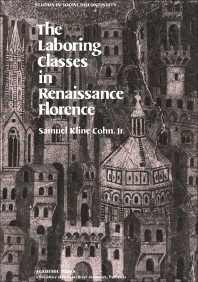 The Laboring Classes in Renaissance Florence investigates the part of Renaissance history that refers to the notarial and criminal archives of Florence. The book presents the relations between the laboring classes and the ruling elite. It demonstrates the class struggle that happened in the Renaissance period. The text also describes the progress of class struggle in periods preceding the Industrial Revolution. It discusses the reforms of the political strategies, list of protests, and awareness of artisans and laborers in preindustrial milieu. Another topic of interest is the tax revolt, food riot, and rural rebels’ resistance during the Renaissance period. The section that follows describes the emergence of ethnic ghettos, impact of immigration, and distribution of population. The book will provide valuable insights for historians, students, and researchers in the field of medieval history.